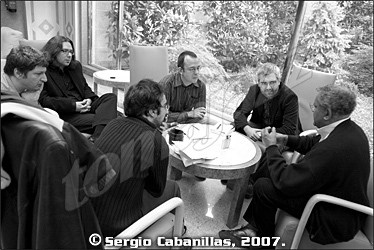 After an intense concert last October at “el Johnny” – the almost mythical jazz club at the San Juan Evangelista students’ halls of residence in Madrid – Anthony Braxton was kind enough to meet Diego Sánchez Cascado, Pachi Tapiz and Fernando Ortiz de Urbina for a (very) early chat the next morning. In person and with no music hardware at hand, Braxton’s professorial appearance gets to the fore, apparently providing a more accurate and balanced view of his persona. His speech is articulated in a way that’s strikingly similar to his music: it is overwhelming because it carries plenty of information in a very structured way, although this may not be perceived immediately. However, this is balanced by a warm gentleness, an unassuming, almost self-effacing attitude, and a surprising sense of humour (we did laugh quite a lot). We are indebted to Anthony Braxton and to his manager, Lalo Lofoco, as well as to Alejandro Reyes and all the staff at San Juan Evangelista for their help. Without it you wouldn’t be reading this. ANTHONY BRAXTON: Well, thank you! I play for the people who can hear my music… I’m very happy to meet you. I’m just very grateful that you guys would want to come to talk about this, I thank you for your interest in my work, I thank you for your support, and so whatever I can talk about that would be relevant, you ask the questions. TOMAJAZZ: You have your own system of music notation by symbols. When you listen to music, are you able to translate that music, that purely sonic experience, into images? ANTHONY BRAXTON: Er, yes, I feel that the dynamics of architectonics are represented sonically, it’s represented visually, and it’s represented intuitively. And so, this is why every composition that I have written has a graphic title, has a coded title, a code-related system, and an opus number title, “three” being the primary generator, or “three to the power of three” it’s the primary generator, and from that, I would say, that every music logic has an equivalent visual logic, and an equivalent signal and symbolic logic… This is what I’m seeking to evolve in my work. TOMAJAZZ: You’re approaching retirement age. What are your plans? 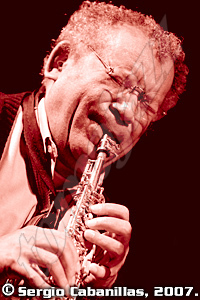 ANTHONY BRAXTON: My plan… well, I think about the next… the senior cycle of my life, I’m 62 now. I’m very concerned that I’m behind in my projections for my system, the music system that I’m building. My hope is to complete the opera complex cycle, the Trillium complex cycle. At this point ten units of the Trillium cycle have been completed, and so there are 16 more cycles. Right now I’m three-quarters of the way through Trillium J, and I expect it to be finished certainly by next September, if not before. And so, when I think about the future I find myself thinking about measuring time, how much time is it going to take to complete the opera cycle, how much time is it going to take to complete other areas of the music system… There is much more to do, and I am still excited by music, so the question becomes how to finish up, how much more can be done while I’m still healthy. Right now, I’m balancing the academic work and the music work. And I’m fortunate to have a job, and I’m fortunate to work in a music school that is a positive music school. Wesleyan has a World Music Department and it has been a positive experience – if I have to teach, I’m teaching at a good place, but more and more, as I get older, I’m looking at time in a very critical way, because I want to complete the elements of the music system and to evolve it, and push it, as far as possible. This is my hope. TOMAJAZZ: We read in Graham Lock’s book [Forces In Motion, Da Capo] that twenty years ago you said that in twenty years, that’d be round about now, you expected to be playing piano for a torch singer. Has it happened? ANTHONY BRAXTON: I’m definitely looking for this torch singer! In fact, Trillium E is being copied right now by Hiram Navarrete and my hope and plan, in the next two years, is to have a performance of Trillium E in Boston. More and more we have started to target Boston as the site for the next opera performances. I mention that because among the things that I’m looking at, in this period of time, is singers. I’m looking at singers, and maybe one of the opera singers might sing opera and maybe I can get her on top of the piano and play some American song form tradition. I’m always interested to meet a nice lady… but the real plan is to find twelve singers, six men, six women, and twelve solo instrumentalists, and I will need something like six months to one year of rehearsals, and then we can bring everything together in Boston, get a set designer and start moving towards a performance. I would like to hope to have an opera performance, say, every four or five years. I have to produce it myself, and so part of the challenge is to save money. I don’t own my own home, I don’t have many possessions, and so my plan is to, whatever money I’m able to make, to save it and project an opera performance, at least once every five years. TOMAJAZZ: With regards to your retiring and becoming of a senior citizen, at yesterday’s concert the two other musicians were students of yours, so, what is the role of your students in the planning of the future of your music? ANTHONY BRAXTON: Very good question. More and more, and I think this started maybe twenty or twenty-five years ago, it became clear to me that I needed musicians who would not just simply be coming from jazz, who would play the head and then improvise, that I needed people who would study the system of the music. When I think of my work, and when I think of my life, more and more I talk of my life and my work as being “in-between”: my life has been in-between the African-American community and the European-American community, my music has been in-between jazz and contemporary classical music, in-between America and Europe and World culture, and the devices that I’ve tried to build and champion are trans-idiomatic devices; trans-idiomatic as a way of saying past, present and future as one; trans-idiomatic as a way of saying improvisation, composition and symbolic as one; trans-idiomatic as saying trans-temporality, that every composition, once it starts, can go into the infinite, that there’s no single-time component anymore, but, rather, all the materials can be used from one second to infinity. And so, I need musicians who are studying the model, who are studying what the system is, as opposed to a guy who just comes in, plays the head, plays the jazz. I need musicians who have knowledge of jazz, who have knowledge of Webern, who have knowledge of Monteverdi, who have knowledge of Picasso, who are not thinking of ethnic-centric parameters, but rather who are interested in universal parameters, and so I have had to teach my own students. Part of the value of Academia has been the possibility to find young people who are interested in my work and to teach them what it is, and, in this way it is possible to evolve the system. I can’t evolve the system if I just bring in jazz musicians, or if I just bring in classical musicians who would play the notated material, but not understand how to use the improvised material, or who can play the notated material and the improvised material, but not understand how to integrate it into the plane of signals. In my music there’s a logic of improvisation, there’s a logic of structural dynamics, and there’s another level of signals that’s taking place. I need musicians who’ll understand all three worlds. And, as such, part of my responsibility is to teach musicians who are interested in this system, how it works, starting from the beginning and to where it’s at now. Otherwise I cannot evolve the system because I need people who are doing homework, who can execute very difficult notated music, or who can function with no notated music, or who can play from graphic scores, or gesture scores… I need people who are not limited to one idiom. 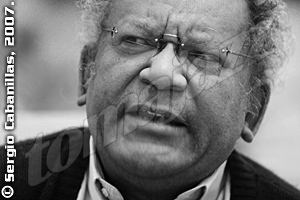 ANTHONY BRAXTON: … Yes, because my music is not a rejection of the tradition, that’s important. My music, the work that I’ve done in the last forty years is an affirmation of the tradition, not a rejection of the system. TOMAJAZZ: So, how do you take your students? Are they already familiar with your music or are they completely new to it? And, if they’re completely new, how do you take them through your system? 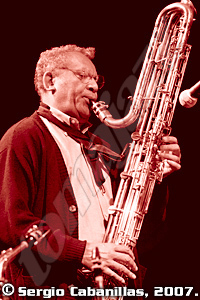 ANTHONY BRAXTON: I have ensemble classes, I have composition, seminar classes… so, I start where the student is at. The most important thing is if they’re interested. The way I see it, if you’re interested, you can learn whatever you want to learn. There’s no limit to what a person can do, if they want to do it. So, we start with the language music improvisation: if they’re not good with reading music, then we take the easier compositions and then, in the analysis classes, I try to teach them how the music works, and… it’s a process, it’s like anything else, but it starts with the students either taking the ensemble class, or one of the composition classes. TOMAJAZZ: How do you approach playing standards, as in the American song? ANTHONY BRAXTON: I have found that it’s very healthy for me, every now and then, to get away from my own music, and to touch the tradition. I still have feeling for the tradition. And so, I’ve tried to, every now and then, to put out a standards CD, but for the most part, for me, the jazz world has become stalled. The African-American community: stalled! The Left and the Right: stalled! They’ve become ethnic-centric, idiomatic, idiocentric… and when I try to play bebop, I try to have fun with it, to do different approaches with it. Sometimes we might play “Giant Steps” and use no chord changes. Sometimes we may have just open improvisation and maybe put something in the middle of it… I try to approach the tradition in a more flexible way. Sometimes we play the music very straight and correct, sometimes we just play parts of it. The tradition, the real tradition, is the tradition of creativity, and, I feel, in many cases, that the stylists and the technocrats have forgotten that the real tradition is the challenge of your own time and to find a creative way to use the materials. You can still play Bach in a creative way… I think of Glenn Gould, the pianist, when he plays Bach, oooh… when he plays Schoenberg it almost sounds like Chopin! It’s personal, it’s creative. The aesthetic imprint and signature of my music is navigation through form, and also, self-realisation, self-realisation through experience, and so… my connection with the tradition is part of just looking for a way to stay alive, to stay creative, and to keep learning.